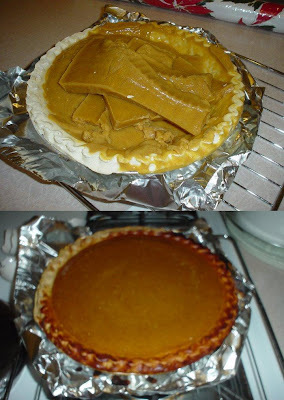 I tried to make a store bought frozen pumpkin pie for thanksgiving one year. Something happened though. While I was traveling to my mom's place (2 hour drive away) it had melted. And when I put it back into the freezer, I didn't know all the pie inside has spilled all over inside the box. When I took out of the box I had to scope out the overflowed pieces and pile them onto the pie.